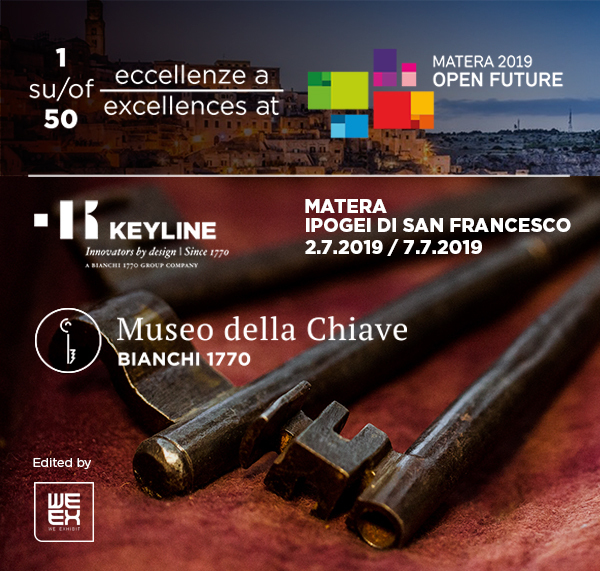 The Bianchi 1770 key museum has been selected by Confindustria for the Open Future project, which is part of “Matera, the 2019 European culture capital.” The project aims to enhance innovative companies that find in culture a fundamental lever of competitiveness and encourage dialogue between culture and business. Keyline with its museum presents an exhibition dedicated to the most representative artifacts of the collection, from 2nd to 7th July at the “Ipogei di San Francesco” in Matera. Within a path that evolves and intersects first with the history of the Bianchi family, master of keys since 1770, and with the one of Keyline, an industry leader today in the sector of safety and automotive. Setting and layout are taken care of by our partner We Exhibit, a Venetian agency specializing in art exhibition. Engaging and unique, the representation of Keyline in Matera in 2019 aims to transmit the values of a centuries-old family history that developed in a manufacturing niche sector and has been able to carry on a business that has grown with passion and innovation, without ever forgetting its artisan and cultural roots.